The official set of dvds from the recent FCI World Championships is available for purchase. We understand that it contains 6 discs with 12 hours of agility, and the cost is 25 euros + shipping. It can be purchased via the FCI website. DVD 5-6: Individual jumping and agility large for all the competitors, prizes and closing ceremony. Found this very interesting from Susan Garrett's blog...Helen King on Structure Evaluation. Definitely worth a read. My friend Penny and her Mom have been having some fun with homemade toys. Love this little video of a toy she made with a half gallon jug. Read more of the post and see the links to Fun-With-Dogs, the German site devoted to enhancing human-canine interaction that we've shared in the past. Although I haven't seen any news from the AKC about this, we've been hearing a lot about handlers that formerly applied for an AKC ILP (Indefinite Listing Privilege) and were rejected are now automatically being signed up by the AKC for the PAL program, so that their 'mixed' breed dog can compete in companion events should hey choose to in the future. Large dogs wishing to apply their Saturday and Sunday qualifying scores from the Nationals towards the AKC 2010 Agility World Team Tryouts must compete in the 26” jump height class. Website is live for the IFCS World Agility Championships, scheduled for May 14th – 16th, 2010. The 5th IFCS World Agility Championships 2010 will be held at the Hand Equestrian Centre, Clevedon, North Somerset, United Kingdom. The biggest news coming out of Cynosport this year is Roving Reporter Rickie Roo. Yes, Roo is a dog...interviewing other dogs at the USDAA World Championships. You can read his interviews in the news section of the USDAA website. What's up with that? A dog interviewing another dog? Is that a trend happening? BOL!! Ok, seriously. Cynosport gets underway tomorrow. 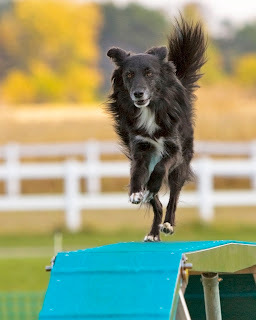 Lots of events going on including: Agility, Flyball, Dock Jumping, Exhibitions and more. Here's the running order for agility. We expect results to be posted in the News Section of the USDAA Website. Here's what else they say..."Subscribers to USDAA.com will have free live stream available. Due to storage and other associated costs, there will be a charge for on-demand viewing. For everyone else, there will be a nominal charge per event or for the package, which will include 30 day on-demand viewing following the event. Details are expected to be posted on Wednesday, November 11th. And we'll leave you with....Autumn Tricks from Silvia Trkman. Hi Johann! I was just thinking today, "I wonder if Johann will do one of his around the agility blog-o-spheres to let us know about the USDAA Nationals?" and you did! Thanks for the links and the info! Also we loved Penny's mom's milk jug idea! Very cute and fun! Glad you liked the toy! Have you noticed that Clean Run are doing another offer of free world-side shipping? I'm buying two Nona Ottosson toys!! we are updating as much as we can with usdaa nationals results and coursemaps. check our facebook and twitter accounts under doghousearts! Thanks for sharing the toy Penny. Ellen - I was wondering if they are going from the most recent submissions backwards, because I've read it seems to be going in phases, or wondering if there is some type of cut off, one year, two years...Guess time will tell.